The U.S. Fish & Wildlife Service has been working in close collaboration with the U.S. Geological Survey Columbia River Research Laboratory and Dr. Thomas Hardy from Watershed Systems Group, Inc. and Texas State University to develop Decision Support Systems such as the Stream Salmonid Simulator or S3 model. The S3 model currently under development for the Klamath River represents an integrated set of sub models that predict the effects of water management alternatives on the production of juvenile Chinook Salmon. This synchronized series of sub-models reflects the array of physical and biological processes that interact to affect the growth, movement, and survival of fish at a given lifestage. A benefit to this method of model construction lies in the ability to update sub-models as new data, new analyses, or new scientific discoveries arise. The current S3 model in development for the Klamath River tracks causes of mortality throughout the sub-adult life history of Chinook Salmon (redd scour, habitat limitations, disease, water quality, etc.) 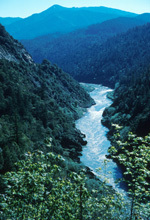 over time within 233-mile section of the mainstem Klamath River spanning from Keno Dam in Oregon to its confluence with the Pacific Ocean in California. The model is also being extended into the Trinity Basin, with the addition of an ocean component and IBM-type upstream adult migration sub module. These improvements will transform the S3 model into a basin-wide, full life cycle model. Future development of the S3 model will also include its expansion to incorporate Coho Salmon, as requested by NOAA Fisheries and the Bureau of Reclamation.